Our judge, Sandy Scott said that this image looked like a ‘wonderful, moody oil painting with perfect composition and colouration’. We agree, there is something almost Constable-like about the image. You can imagine a horse and cart trundling along to the left, just out of shot. With that in mind, it may be a surprise to discover that the image was taken at ‘Island Safari Lodge’, northwest of Maun in Botswana! 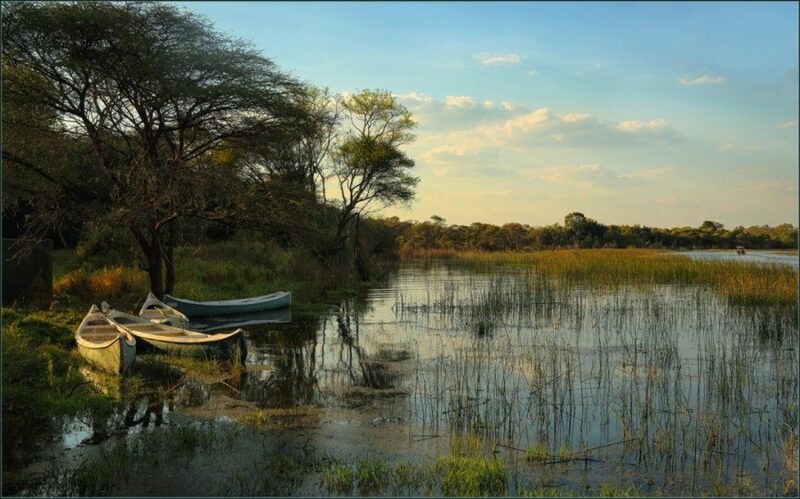 The image takes in the Thamalakane River, just South of Okavango and was Mary and her family’s last stop before entering the Okavango and the Moremi Game Reserve. The image was taken whilst Mary was on holiday in the area, and her husband was there to do some work! Mary and her family moved to Botswana originally for two and a half years, but ended up staying for thirteen years, before returning to the UK due to family circumstances. She says, ‘It was just a wonderful place to live and bring up children and we have many happy memories of this fantastic country’. This is one of Mary’s favourite spots – she had been hoping to photograph some of the wonderful coloured birds that can be found in that area, but as the light turned to that beautiful golden glow, Mary was drawn to this view and captured it! The image didn’t need much post processing. There was, sadly, quite a bit of rubbish in the foreground, so Mary tidied up the image by getting rid of that, and the image was then as we see it above. Mary’s only regret with the image is that there are modern canoes, rather than the traditional ‘mokoro’ or poled dugouts, but as she says, you can’t have everything! Mary says that going to Botswana was the main catalyst in her interest in photography. She wanted a decent camera and read up on the best buys, going for one that would withstand both the heat and being shaken around in a four-wheel drive on unmade roads! The camera did that, however, there were no photographic shops or processing laboratories in Botswana at that time, so, after some research, Mary built herself a darkroom and, as they say, the rest was history! After the stunning opportunities of Botswana, Mary’s dream photographic destination is bound to be somewhere pretty special! It is! The place that she would most like to go and take photographs is Madagascar, due to its unique flora and fauna. Mary’s next photographic venture will be the Peak District as she would like to improve her landscape photography, whilst visiting relatives in the area. We’re not sure that your landscape photography needs much improving Mary! Congratulations again Mary on being both the winner AND a runner up in our ‘The Great Outdoors’ photography competition and we hope to see more of your work in the future!